Dear diary, The boy that I thought might ask me to the Valentine’s Day dance, did not. He asked Jessica. Jessica, the cute cheerleader, who has a million other prospects, said yes and she doesn’t even like him. I hate highschool. I will die if I’m not asked to the dance. How will I ever face everyone Monday morning? I know. I’ll just make up other plans and pretend I don’t want to go. That’s a good idea. I’ve saved up some babysitting money. I’ll send myself flowers from an out of town admirer. That’s it. Perfect. No-one has to know. What is his name, his story? He’ll be named Todd. No Todd’s at my school and I do know a Todd so I’ll pretend it’s him. I’ll pretend his family and my family are long time friends and a couple of years ago he and his family moved away. We write letters often and he pines for me. I’ll see him this summer when our families camp together. And Todd will apply to the same colleges I do. No one has to know the truth. This is my secret. This will work. And I don’t even have to face the stupid dance. I would hate it anyway. Besides it’s only stupid high school. I know it’s a lie, but it won’t hurt anyone. It doesn’t matter. At least this will take the pressure off. High school is stupid anyway. Dearest daughter, It breaks my heart to see your broken heart. You wear such a brave face. But I see you. I know you. I created you. I love you. It saddens me to watch you go to such lengths to protect that soft vulnerable heart that I formed in you. That lie that you think won’t hurt anyone, will be with you for the rest of your life. I’ve given you free will, but as your Heavenly Father it pains me to watch you looking for love in all the wrong places. Your innocence and idealism are precious in my sight. The world though, sees your innocence and idealism as an opportunity. You’re an easy target. The world is luring you, training you, influencing you to be enticed by her seductive ways. Already you’re convinced that being thin and pretty and popular would make the difference. You believe that if you had a boyfriend, then you’d have worth; then you’d have value; then you’d be significant and secure. They are lies. They are all lies. It grieves me when my sons and daughters insist on learning life lessons the hard way. The world is such a cruel teacher. I know where you are headed. The world is coaching you to crave its applause and recognition for your achievements. You are smart and capable. That is no surprise to me. I created you. The world is impressed. But knows that you’ll never be satisfied. She is rewarding you with accolades and success. She is cheering you on so you’ll keep striving. She is teasing you to think you can do it all on your own. But her goal is the ultimate sucker punch. The world’s goal is for you to believe that no matter what, you are never enough. The world’s applause is numbing and recognition is your drug. I, my dear daughter, know the futility of your counterfeit god. That ache deep in your soul cannot be quenched apart from me. The world’s promises are empty. Eventually you will crash and burn resulting in just another devastating blow to that soft vulnerable heart I formed in you. Each blow makes your heart a bit harder. I’m the one who pines for you. And my love is perfect. Unconditional. Sacrificial. You are my daughter by birth not by your worth. If you could only fathom that! Just imagine? The creator of the universe, the One you laid the foundation of the world, the One who placed the stars in the sky, and numbered the hairs on your head, longs to have a personal relationship with you. You, Deborah Lynn Roeshot, the broken hearted, sixteen year old with braces, big dreams and one hundred twenty pounds of awkward insecurity are my daughter and you’re beautiful in my sight! Do you remember the parable of the lost sheep? (Luke 15:3-7). You, dearest daughter have drifted from the flock. I will not rest until you return. I will relentlessly pursue you until you are reconciled to me. (Jeremiah 29:11) I have plans for you. Plans to prosper you and not to harm you. Plans to give you a hope and a future. Those plans require a vulnerable softened heart. We have work to do. Come back to me beloved. It probably won’t surprise you to know that forty-two years later I still don’t like Valentine’s Day. Even though now I’m happily married, the day reminds me of my painful search for love in all the wrong places. A search that lasted a very long time. True to His promise, Jesus relentlessly pursued me. Jesus caught me and I fell hard. His grace was irresistible. But, I’m fickle. I’m human. I’m forgetful. The Bible is God’s love letter to me and to you. From Genesis to Revelation it tells of His unrelenting pursuit of us, his creation; a people who have turned their backs on Him and who constantly push Him aside. It is a story of redemption and reconciliation; a story of God’s ultimate sacrifice in order that we might be restored to Him. Until you “grasp how wide and long and high and deep is the the love of Christ, and to know this love that surpasses knowledge,” Ephesians 3:16, the rest of life won’t make sense. When you do grasp that truth, you’ll know that you are enough. In other words, Jesus’ love makes all the difference. Through the lens of His perfect love, your flawed human relationships make sense. Through the lens of His perfect love your pain, your disappointments and your struggles have purpose. Through the lens of His perfect love that ache to be enough is satisfied. Thank you Jesus. I love you. It’s good to be back. Ephesians 3:16-19. “I pray that out of his glorious riches he may strengthen you with power through his Spirit in your inner being, 17 so that Christ may dwell in your hearts through faith. And I pray that you, being rooted and established in love, 18 may have power, together with all the Lord’s holy people, to grasp how wide and long and high and deep is the love of Christ, 19 and to know this love that surpasses knowledge—that you may be filled to the measure of all the fullness of God. Amen April. Even the best marriage cannot take His place. Prayers for you sweet sister as you cling to Him for your sufficiency. So true! In our own eyes, the eyes of the world, we are never good enough, don’t have the right figure, or the right smile with perfect teeth that the world tells us we need! Why didn’t God make us all with the Barbie Doll figure. Wonder why we/ many of us don’t see Jesus sooner, as the one who loves us for who we are! Sadly too many of us never realize the lie and His sufficiency. Welll said. What a great reminder. Amen, Sister! The world sells us what “ideal” should look like. So when we don’t have a crowd of family around the Christmas feast or don’t look young enough or don’t get the diamond pendant for Valentine Day, we just don’t measure up. The world makes us feel less than. How depressing! But He raises me up beyond these worldly things and loves me just as I am. And that fills my heart with peace and gratitude. Amen. Thanks Dorma. Isn’t it just like that sneaky serpent to tailor make his lies to be the most hurtful to us. Thank you Debbie. A wonderful reminder where our true worth comes from. It’s so easy to forget. But the truth is so empowering. Oh, yes, Debbie! I once sat on the shore of the ocean in Hawaii. There was a big rock that pushed into the water away from the shoreline just enough so that, when I sat on it, the only thing I could see from my left or right was the vastness of the ocean. How like God’s love is the ocean…overwhelming, ready to rush over me with excitement and joy. For below me we’re the tiniest of shells…I could get 50 or more of them in my hand. God made each one perfectly and intricately designed, like He made me. My feelings of loneliness are not insignificant to Him. Like the tiny shells, I matter, and Jesus alone fills my loneliness. Thank you for the reminder that I am not the only one whose had difficulties in this life. As a tiny shell, I may get tossed in the ebb and flow of life, but I gently settle again when I recognize Who is flooding me with love. Jesus fills our empty places with love, joy and peace. And thank you, for providing a platform for me to share one of the most significant experiences in my life. What an excellent mental picture of His extravagant love and care for us. Thanks for sharing! So beautifully put together and pulled off Deb. I’m printing this off so I can re-read it later, slower, and use it in my devos too; those days when I need to be strengthened (heck-even reawakened!) to this incredible truth. One of your lines, about the Bible being God’s love letter to us, instantly reminded me of Larry Crabb’s book, “66 Love Letters.” Made me want to get it, for the privilege of reading LOTS MORE of the Bible from that lens. Aww thanks Nom. The truth of His love is so empowering. It’s true, Debbie: Jesus’ love is deeper, purer, more faithful, and more satisfying than anything the world has to offer. He is relentless in pursuing his children and has drawn me back to him more than once! How can I not return the Love of Jesus?! Jesus’ love is compelling and real. 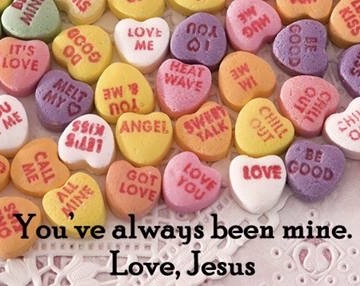 Thank you for putting this truth into this “valentine” message. I appreciate you very much! This was just so excellent!!! This speaks right into the heart of women, of me! No earthly love can compare to His love! I too remember looking for love in all the wrong places, and although I am blessed with a wonderful husband of 33 years , it is not without the angst that comes on this side of eternity! Jesus my Savior , my One true love ♥️ Thank you Debbie! Keep writing , I love your posts! Happy valentines Day! Mary Ann, Good to hear from you. Isn’t it comforting too, to realize that it is a universal struggle. Jesus really is our one and only. Our marriages are better when Jesus is at the foundation. Thank you, Debbie. What a perfect reminder that God’s love for each of us is not abstract, but very, very personal. I needed that reminder, and I forwarded this to a friend who wrote back that it was just what she needed at that moment! Amen. Thank you Karen. That is real faith. To believe His love is REAL, tangible, not abstract. But the reward …. unmistakable and eternal. Every teenager should have a copy of this to read on special occasions like Valentines Day. Superbly written! It also reminded me of God’s unending & immeasurable love He has for all His children. Thank you. Thanks Paula, I agree that teenage girls universally lose their way in the love department. I appreciate your comment. Please do share. Thankfully His love is ageless. Beautiful!! Happy belated Valentine’s Day! Thanks Cindy. I’m pleased to know you were blessed.